Fast Company asked leaders at Target, Warby Parker, Mall of America and electronics retailer B8ta which stores "get retail right." The most common answer in the Nov. 24 article? 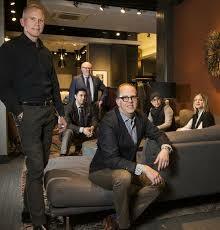 Minneapolis men's and home retailer Martin Patrick 3. MP3 co-owner Greg Walsh said he hears raves from customers, vendors and other retailers, but major trade publications such as GQ and Esquire have so far ignored the North Loop luxury retailer. Askov Finlayson, the North Loop menswear store owned by Eric and Andrew Dayton, and Hubert White, the 101 year old men's retailer in IDS, have both been mentioned by one or both publications. Walsh hardly has time to notice the oversight. His store, which he co-owns with his "partner partner" Dana Swindler, continues to enjoy phenomenal sales year over year. While the number of people visiting stores nationally on Thanksgiving and Black Friday fell 4% this year, according to RetailNext Inc., Walsh said, "We projected and set a sales goal for 30% growth over last year, and we did it for each of the three days of the holiday shopping weekend," he said in an email. That's on track with growth of 30 to 40% for each of the last five years at MP3. The luxury retailer's success is all the more surprising in the Twin Cities, which many say has reputation for frugality, despite its relative wealth. Saks Fifth Avenue, Neiman Marcus and Bloomingdale's have all closed in the Twin Cities. Fast Company calls MP3 "a store mostly for the 1%," but Walsh insists that the store will always stock good, better and best lines. While it's possible to get a casual wear shirt for less than $80, many Minnesotans probably blanch at shirts costing $200+ and Brunello Cucinelli suits at $5,000. "Even I am sometimes shocked at how much a suit or a sweater costs," Walsh said. "But we bring in what customers are requesting." Early next year, MP3 will open its last expansion, a 4,000 square feet space, that will be the fourth since 2010. After that, the 131 year old building at 212 3rd Av. N. in Minneapolis has no more leasable space. Walsh and Swindler have no plans for a second store. They prefer tweaking the original to be as good as it can be. Three of the five retailers that Fast Company expects to shine in the age of Amazon are Twin Cities based. The article details successes at Mall of America (expanding at a time most malls are shrinking), Target (new, exclusive private labels such as Cat & Jack, Pillowfort, Project 62, JoyLab and Goodfellow & Co.) and Martin Patrick. New York-based Warby Parker eyewear is mentioned for its efficiency and an elevated personal experience and San Francisco consumer electronics retailer B8ta is touted for selling only a limited selection of trendy gadgets such as Boosted electric skateboards.